Urban areas are increasingly bearing the cost of climate change. Because of this, a growing number of cities are embracing sustainability projects that make them more resilient and competitive in a new economic era. Some smart city projects are leveraging Internet of Things (IoT) technology that enables them to deploy sensors and collect data to make critical city systems more intelligent, interconnected and efficient. Cities are now partnering with clean tech startups and large corporations in projects that include traffic management, parking optimization, green buildings, energy efficiency, smart grid, water efficiency, waste-to-value and recycling. All of these new technologies are enabling cities to generate more renewable energy and become less reliant on the electrical grid. In fact, a recent Sierra Club report highlights 10 U.S. cities that have made commitments to be powered entirely by renewable energy. Burlington, Vermont; Aspen, Colorado; and Greensburg, Kansas, are the first three cities in the U.S. that are 100 percent powered by renewable energy, according to the report. The Washington, D.C., area’s Dulles Airport corridor will become a proving ground for smart city technologies due to a project led by private equity firm 22 Capital Partners. The foundation for the technologies will be the 22 CityLink platform, which has been described as a “Smart City In-a-Box” according to GCN.com. Microsoft is a partner and will help build the platform, leveraging its CityNext program and its focus on neighborhood management, smart buildings, operations management and sustainable land use, according to the Washington Business Journal. Other big tech firms are following suit. Google-funded Sidewalk Labs, for example, is working on projects to make it easier to drive and park in cities and to create hybrid public/private transit options in American cities, according to The Guardian. Sidewalk is initially offering its cloud software, called Flow, to Columbus, Ohio, the winner of a recent $50 million Smart City Challenge organized by the U.S. Department of Transportation. Flow is a smart traffic platform that suggests the best routes based on pricing and timing. Sidewalk Labs is also working to help drivers find parking spots more efficiently, which can significantly reduce car emissions in major cities. And IBM has made smart cities a cornerstone of its new business strategy, which leverages its cognitive computing capabilities, such as its Watson system, to help generate smart solutions to city problems utilizing data collected from its sensors. 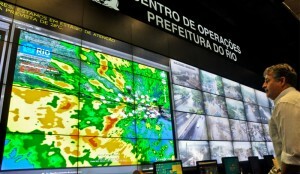 IBM designed a command center for Rio de Janeiro that gathers weather and traffic data from 30 agencies. In addition to a transportation project in Miami to optimally route buses based on historical patterns and weather data, and detecting leaks in aging water infrastructure in Washington, DC, that cause up to 70 percent of municipal water to be lost, IBM is working on smart city projects across the globe. The company is building air pollution prediction models for major Chinese cities, improving traffic congestion in Stockholm, Sweden and increasing water supply efficiency in Bangalore, India. Partnerships are key to IBM’s smart city strategy. For its transportation projects, IBM has partnered with startup Streetline, which develops street-level sensors, mobile apps and parking analytics to manage parking in cities. Streetline raised $10 million in Series D venture funding in 2014 from investors including Sutter Hill Ventures, Qualcomm, Frontinalls Partners, Citigroup, Rockport Capital, and True Ventures. Current estimates indicate that buildings contribute as much as one third of total global greenhouse gas emissions, according to the United Nations Sustainable Buildings & Climate Initiative. And IBM sees vast opportunities for the Internet of Things to be implemented in smart building projects, including data centers, to optimize HVAC loads and building performance, says Peter Williams, IBM’s CTO of Big Green Innovations. And Vancouver, Canada will now require zero emissions from any new buildings by 2030, according to a new plan adopted last month. All new city-owned and Vancouver Affordable Housing Agency projects will be built to certified passive house standards, according to the plan, which did not include details about retrofits for existing buildings. To achieve the zero-emission objective, the city will focus on making building envelopes more efficient. It will also consider district heating systems and shared infrastructure for heating and cooling multiple buildings in dense urban areas, says the National Observer. And in February, Vancouver launched a new $1 million fund to help spark energy efficiency upgrades in buildings. It will also fund a non-governmental Zero Emissions Building Centre of Excellence to help gather and spread the knowledge needed to complete zero-emission buildings. The city of Dallas is recycling at just half the rate it set as a goal in a “Zero Waste” plan that City Hall approved three years ago, according to the Dallas News. The plan’s first benchmark calls for getting Dallas residents and companies to send 40 percent of their waste through recycling or re-use channels by 2020. The city is currently at about 21 percent. Now, Dallas is considering mandatory recycling for multifamily and commercial buildings if the voluntary program can’t meet its goals, says a director in the city’s Sanitation Services Department. In December, the city agreed to a public-private partnership with Spanish construction company FCC to build and operate a new recycling facility at a landfill in southern Dallas. The state-of-the-art automatic sorting plant will recycle thousands of tonnes of paper, cardboard, glass, plastic, metals, etc. San Francisco and New York City are two other major cities with zero waste goals, says Steven Cohen, executive director of the Columbia Earth Institute, in an analysis of the two policies. San Francisco is aiming for zero waste by 2020, while New York’s goal is 2030. Chester, Nova Scotia and Sustane Technologies will build a new $16 million plastic bag waste-to-energy plant in Nova Scotia. Sustane will convert 90 percent of Chester’s black bag garbage into biomass pellets, recyclable materials, and eventually diesel fuel. The facility will be the first of its kind in North America and debut technology found nowhere else in the world, says Peter Vinall, co-founder and CEO of Sustane. Vinall says the ultimate goal is for Chester to reduce greenhouse gas emissions and never need a landfill again, according to CBC News. In February, Sustane won a $225,000 seed investment from Innovacorp to commercialize its technology. The city of Phoenix and renewable energy firm Ameresco say they will develop a wastewater biogas-to-energy facility. Ameresco will design, construct, own, operate and maintain the facility, which will be built at a Phoenix-owned wastewater treatment plant. And in June, Ameresco received a $72.2 million contract to improve the energy efficiency of four federal buildings in Washington, D.C., including the headquarters of the U.S. Environmental Protection Agency. Santa Monica, California, received a $1.5 million grant to design a microgrid that incorporates renewable energy, energy storage and electric vehicle charging and controls into the city. The funding comes from California’s Electric Program Investment Charge (EPIC) program, created to bring innovative clean energy ideas to market. And a privately funded effort in Brooklyn, NY, called Brooklyn Microgrids, which launched in 2015, is developing a community microgrid that installs infrastructure, such as smart meters, solar panels, and energy storage, to enable a small network of buildings to operate independently from the utility grid. The company completed its first microcrid transaction of solar power in the iconic Brooklyn neighborhood of Park Slope in April.